Michelle Evans is our Head property manager. Michelle has worked with us years ago in sales however she has found that property management is a much better fit for her. Michelle loves working with people and finding the right home for them. She also particularly likes and is very good with the paperwork involved in ensuring that the tenants and owners have a smooth and pleasant rental experience. 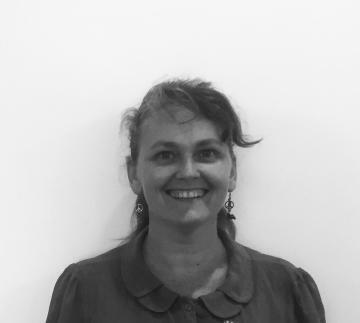 Michelle has lived for years on both Karragarra and now Macleay Islands and loves the peace and quiet we have on these beautiful Bay Islands. This sweet cottage is situated on a beautiful Island hideaway only an hour away from Brisbane city yet feeling like a million miles away from the rest of the world. This Island paradise is unique in the bay with no shops, just residences making it the most peaceful and quiet of Islands. This lovely cottage is approximately 1km from the jetty and the white sandy beach that makes Karragarra so special. Call the resident agents to arrange an inspection. This is a beautiful wee cottage, ideal for a single person or a couple. There is only one bedroom, but that bedroom takes up nearly all of the 2nd floor of the home along with a large bathroom. Downstairs is an open spacious kitchen. The home has lots of sliding glass doors on to decks front and back and lots of windows to let in the lovely Island sunshine. The living area is very open plan with lots of space and there is a 2nd toilet and sink downstairs. This is a modern open plan home in a private and secluded position with lovely water views from rooftop deck area - a perfect spot to enjoy the Island breeze. 1-2 bedrooms plus bathroom downstairs. The living areas and a modern kitchen are upstairs. The kitchen has a new oven and cooktop that have just been installed. There are fabulous verandas on both levels. The home also has a secure garage area. This property would really suit a nature lover looking for peace and quiet. * Quality three bedroom three bathroom two storey home. * Lock up garaging for three cars plus workshop and room for the tinny. * Oversized bedrooms. * Huge separate living and dining areas with raked ceilings. * Chef's kitchen with gas cooktop, electric fan forced over and drawers galore. * Fully landscaped and fenced. * Water views and three metre wrap around decks. This beautiful waterfront home is just oozing with character, it won’t last long! The moment you walk through the door you’re greeted with a fully enclosed deck that runs the length of the house that has been fitted with screened windows all along, so you can enjoy the sea breezes right throughout the home. The open plan living area also offers glass sliding doors that open onto the deck and polished wooden floors that flow right through the home. There is a good sized kitchen with views out to the ocean and a separate laundry with access to the side of the property. Property Features: 3 good sized bedrooms all with built-ins. Two way bathroom through to the main bedroom Open under house storage area Separate laundry Ramp to the front door providing easy access Polished wooden floors throughout Water views from the kitchen Complete waterfront Call for an inspection today! Disclaimer: We have in preparing this information used our best endeavours to ensure that the information contained here is true and accurate, but accept no responsibility and disclaim all liability in respect of any errors, omissions, inaccuracies or mis-statements contained in this document. Prospective purchasers should make their own enquiries to verify the information contained here. This family home has plenty of space and charm. There are 3 bedrooms, 2 upstairs and one downstairs. The family room that is downstairs includes a pool table and accessories. Upstairs has a sunroom, large lounge/dining area and a spacious kitchen with plenty of cupboards, bench space and a pantry. The kitchen has an induction stove for the family chef. There is also a balcony off the kitchen for your morning coffee and chat with the local bird life. This two bedroom home has a lovely big deck with a ramp and a shade sail at the back. It is fully screened and sits on a good sized block on a bitumen road. The living area is quite large with a ceiling fan and is well lit with plenty of windows. The kitchen has plenty of cupboard space. There is a bay window in the second bedroom and both bedrooms have security screens and fans. This is a lovely clear flat block under a kilometre to the jetty and shops, so this is a fantastic location. Fenced on two sides, this block is ready for your new home. There are lovely new homes surrounding this block of land and the Street is a quiet no through road so there is very little traffic, so it is also a very quiet position. Karragarra Island, often called the "jewel in the crown" is a small and peaceful Island, loved by it's inhabitants! If you are looking for a stress-free and peaceful life and love trees and nature then you should inspect this property. Elevated with great views and access to the water, this home has lots to offer:- • Special huge screened entertaining patio with air conditioner and louvers, including servery to the kitchen. • Front deck great for BBQ’s or to enjoy your morning coffee in the fresh air • Great views to the mainland across the water • Open plan air conditioned living area with polished timber floors throughout • Two generous sized bedrooms upstairs, master with ensuite + separate bathroom, both with ceiling fans. • Large bedroom/rumpus room downstairs with toilet and vanity and it's own entrance, perfect for guests. • Attractive, well established gardens and lots of under house storage including shed. • Fenced with access to the waterfront. Call for an inspection of this unique and very special home. Pets will be considered upon application. *Disclaimer: We have in preparing this information used our best endeavours to ensure that the information contained here is true and accurate, but accept no responsibility and disclaim all liability in respect of any errors, omissions, inaccuracies or mis-statements contained in this document. Prospective purchasers should make their own enquiries to verify the information contained here. This is a beautiful 1 bedroom house. It is absolute waterfront with great views from the large deck. The bedroom has a ceiling fan and there are two other wall fans in the kitchen/lounge area. The open fire place will keep you warm and cosy on a winters evening. The house is high set which creates plenty of storage space. There are two carports, one has a higher clearance that is suitable for a boat. The property is fully fenced and only a 10 minute walk from the jetty. This immaculate home is situated in a nice quiet Street high up on this Island paradise where the home is well positioned to catch the beautiful bay breezes. Enjoy the quiet lifestyle that Island living has to offer. There are two good sized bedrooms and one bathroom, a good sized living area and two good decks. The house is tiled throughout for easy care. The yard is fully fenced, flat, clear and great for the family to run around in. There is a water tank and bore on site. This wonderful home looks out over Moreton Bay in complete luxury. The front entry from the waterside of the house features a staircase to the upstairs bedrooms. To the right is the spacious lounge that is set up for relaxation with a lounge suite, arm chairs, T.V. and Foxtel, ready to go. There is a formal dining room and an informal dining area on either side of the kitchen. The kitchen is well equipped for the master chef of the family. This is a beautifully built near new home with three large rooms - approved for 2 bedrooms, but the media room would make an ideal third bedroom. There is a large two way bathroom with a separate shower and bath tub and there is also a separate second toilet. The kitchen is modern and open and has a stainless steel electric oven and a stainless steel gas cooktop. This really is a beautiful home. This is a beautifully built home with three large rooms - approved for two bedrooms, but the study would make an ideal third bedroom. There is a large two way bathroom with a separate shower and bath tub and there is also a separate 2nd toilet. The kitchen is modern and open and has a stainless steel electric oven and a stainless steel gas cooktop. There are decks front and back of the house and a carport. A beautiful home. This is a larger two bedroom home with a large living - dining area. Polished wooden floors in the living area with carpet in the bedrooms. The kitchen has excellent cupboard space and is set off the laundry. This house is set on 1/4 acre block with manicured gardens. The gardens are looked after each weekend so there is no worry of spending your weekend in the garden unless you want to. This beautiful home is a one of a kind. It has been built with solid timber thoughout. There are two good sized bedrooms and two bathrooms with marble finishes. Ceiling fans help keep it cool in summer, however there is plenty of breeze being near to waterfront and in an elevated position. The kitchen is lovely, looking out of the deck, with ample cupboard space. There is a wrap around verandah and storage area and laundry downstairs.